As soon as this one started...I told the wifey, "We're never showing up at some camp place in the middle of the night. Hell no." Yeah, now that I think about it - I'm never staying a trailer park. Nope. 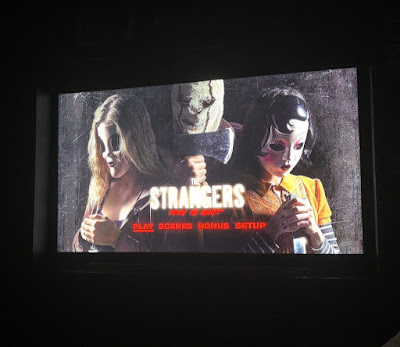 THE STRANGERS: PREY AT NIGHT reminds you that their a crazy people out there. (lol) I think it's worth a watch. Cast did great. Totally believable. Curious though...will there be a Part 3? Did Man in Mask survive? Hmmmmmmm...I guess we will have to wait and see.